Everyone deserves Nice Hair. Nice Hair is inclusive, not exclusive. Nice Hair has a home. This means you have a home- the home of a trusted friend. Let our home welcome you with open arms and help you feel more like yourself. Nice Hair is not exclusive, it is inclusive, meaning you include us in your journey. 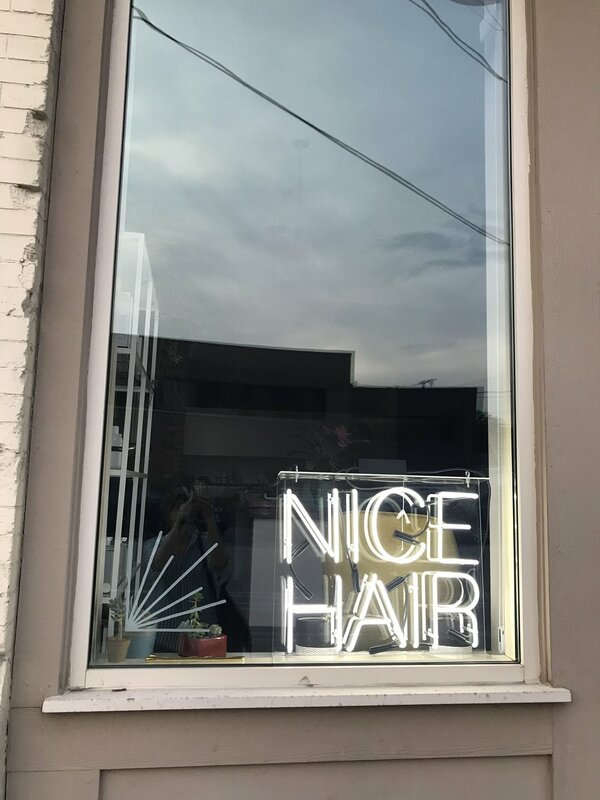 Nice Hair's journey began as a gathering of local hairdressers, with the goal of sharing our craft, knowledge, and inspiration with one another. Our intention has always been to support and grow each individual hairdresser in our community, because when one grows, we all grow. We have a commitment to expanding our knowledge and skill in an approachable way. We find friendliness and kindness to be our greatest teachers. If you might like to treat yourself to Nice Hair, Salon Services are listed below. Online Booking Appointment request link right here. Learn about our committment to Sustainability or brush up on our New Salon Policies! Looking for the perfect gift? Give the gift of Nice Hair instantly with an Egift Card. We are a hair salon! While we enjoy all aspects of hair, not all team members perform every single service. We support their choice to specialize in the services they find most passion in. We hope that you will appreciate their time, skill, and specialties as much as us! Our goal is to keep it simple. Complimentary, one on one time with a pro to talk about ideas, options, goals, and pricing. Bring photos that you like and ones you dislike! We have your best interests in mind. All haircuts include a wash and style, depending on your hair's needs. Higher priced stylists have more years in the industry, more education, and specialize in certain techniques. Haircuts with Kate automatically support a participant in The Highlight Project! We kindly ask all New Haircolor clients to book a consultation. Color quotes are very personal. There are many techniques and artistic talents that go into every color. Root retouches are a whole different animal than corrective-blonde-balayage services. Don't worry about what to ask for, just ask for color and let us worry about the techniques. Please contact us for a more in depth Consultation, and time/price specific to your hair, budget, and desires! Welcome back! Your hairdresser will have a plan for you and we can book accordingly. Let someone else hug your brain for a minute....one less thing for you to do! This will require an in-person consultation. We love sharing in special occasions! This might be a wash, dry, and curls. It also might mean a braid or upstyle. If you are planning a wedding, Congratulations! Wedding planning is more detailed and you should have a helpful person focused on your needs. Email krystle.nicehair@gmail.com for Wedding consultations. It is our responsibility to be forward thinking regarding the waste we create, how we dispose of it, and what companies we partner with. The Beauty Industry alone creates over 420,000 pounds of landfill waste per DAY! Not Nice. Green Circle Salons has allowed us to reduce a significant amount of our landfill waste. 85-95% of our typical landfill waste is diverted because of our partnership. Your extra haircolor, foils used, and even your hair is repurposed! An Eco-Sustainability fee of $1-2 is added onto all haircut and color services. We ask this so that you can proudly share in the repurposing of your own waste. How beautiful is that? Without you and your contribution, imagine how many bags of landfill trash we would accumulate? We proudly carry product brands that are all Cruelty-Free, Eco-Conscious, and are high performing. Let’s be honest. We all struggle with our own ideas of what beauty means. As beauty professionals, we honor that beauty comes from within. The trust that can be formed between a client and a hairstylist can create magical transformations, both on the outside and the inside. The Highlight Project is meant to help create new definitions of beauty, self-esteem, confidence and mentorship for female youth in our community. Navigating growing up, while also navigating ideas of Self- Esteem, Confidence, Relationships, Awkwardness, Friendships, Change, Expectations…..it can be a puzzle for even the most skilled adult. Participants in The Highlight Project will receive Complimentary hair services every 4-6 weeks. Want to sponsor a Service?? Schedule a Haircut with Kate! Sponsorships will be built into her service cost. It’s like a buy one get one sort of gig! Parent/Guardians/Teachers/Collaborators: email us at nicehair.highlightproject@gmail.com to inquire! All Education events will take place on Mondays, unless otherwise noted. We find that sometimes working around other creative professionals is more valuable than a formal class. Hang out with other Hair nerds, have a drink, and do cool hair. $20 cover charge at the door. Additional fees for backbar/color costs can be quoted during studio date. Your appointment is very important to us at Nice Hair. It is reserved especially for you! All the hair that we do is completely customized and personal to each client. Our Policies protect our stylists' time and also allows us to alert our standby clients of any surprise openings. We always understand when unforseen circumstances arise. We sincerely appreciate your respect for both your stylists and your fellow clients! Thank you! *We respectfully ask that all appointment changes be made within 48 hours. *Last-minute Cancellations or Changes, and No-Shows will be asked to Prepay (100% deposit) for their next service to secure their desired time. *All New Haircolor clients are asked to schedule a New Client Color Consultation to determine service, time, and price. *Services requiring 3 hours or more will be asked to pay a Non-Refundable $100 Deposit, to be used towards final service. This protects your time and the time of your stylist. 48 hour cancellation/reschedule/no-show policy still applies. Your deposit will be forfeited if changes are made within the 48 hour policy range. *Product Return- Products with 2/3 product remaining can be returned within 30 days from purchase for In-Store Credit. "Give the ones you love wings to fly, roots to come back, and reasons to stay." Salon appointments by phone, online request, email or in person.